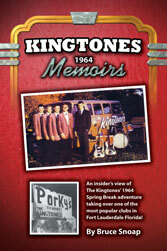 Kingtones Memoirs 1964 Book Now Available! For fifty years the Kingtones entertained the people of West Michigan. They recorded and released 7 records with three of them reaching the "Top 10" on the local Grand Rapids radio charts, and one of them going to number 1 for five weeks in a row. Their version of Buddy Holly's classic song It Doesn't Matter Anymore, went International. They were one of the most enduring and successful regional rock groups from the state of Michigan. Because so many people still show an interest in the Kingtones, Bruce Snoap has written a book for the fans that takes them back in time to the Kingtones height of popularity. Taken from a daily journal that Bruce kept, the book transports the reader back to Spring Break of 1964, when the Kingtones went to Florida and got a job in Fort Lauderdale at one of the most famous nightclubs of that time: Porky's. So for all you Kingtones fans out there, you can once again "get together" and enjoy yourself with the band, with an insider's view of a brief yet incredible part of the Kingtones 50 year career in their new book, Kingtones 1964 Memoirs. It is now on sale at Schuler's Books and Music in Grand Rapids and can also be purchased at www.amazon.com. by becoming a member of WGVU Public Broadcasting! When you become a member, you'll get back much more than The Kingtones merchandise - you'll get the benefit of quality programming on WGVU. And, if you contribute at any of the membership levels listed below, you'll automatically receive a WGVU membercard, good for discounts across West Michigan and a subscription to the Showplace program guide, so you'll always know what's on! You can become a member by calling 1-800-442-2771. WGVU and The Kingtones would like to thank you for your support to Public Broadcasting in West Michigan with one of the Kingtones packages listed below. 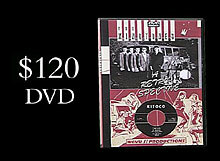 Remember, this is almost the only way to get your hands on a copy of "The Kingtones: A Retro-Spective" DVD.